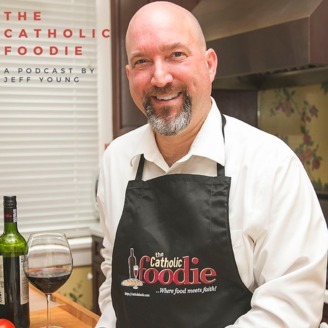 The Catholic Foodie... Where food meets faith! I must confess that Halloween is my favorite holiday of the year. That might sound strange to you, since I’m the Catholic Foodie. But Halloween is a Catholic feast day and celebration. Not only is All Hallow’s Eve the vigil of the Solemnity of All Saints, it also kicks off a month dedicated by the Church to remembering and praying for the dead. Perfect time of the year for it… Fall… as we prepare to enter the death of winter. For me Halloween carries with it so many memories from my childhood and adolescence. Good memories. I have Halloween and all the spooky otherworldly trappings that surround it to thank for instilling in me a deep understanding that there is something more to life than meets the eye. There is a mystery just beyond the veil of visible life. And this time of the year the veil seems to thin between the visible and invisible. So, see, not strange at all, right? Or is it? Today, on Halloween, I bring you a special Halloween edition of The Catholic Foodie Show. So get ready. Turn on the lights and grab your rosary and holy water if you scare easily, and join me along with a couple of Sick Pilgrims – or perhaps today we should say Stranger Pilgrims – as we dive into the Catholic weirdness of Halloween. 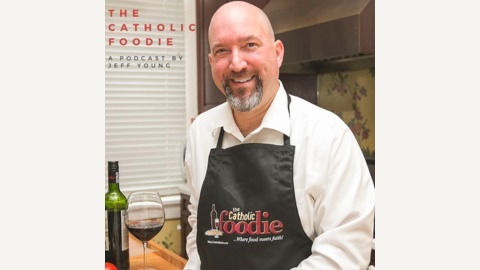 Jessica Mesman Griffith and Jonathan Ryan of Sick Pilgrim blog join me today for this special Halloween edition of The Catholic Foodie Show! Full show notes available at CatholicFoodie.com.